As California faces a historic drought, many farmers are relying on groundwater reserves to carry them through the dry season. Pumping groundwater is currently unregulated in California (that could soon change), and drawing on reserves now could cause shortages in the future. Sustainability-minded farmers are looking ahead and using an arsenal of methods to conserve water. Here are just a few. Drip irrigation systems deliver water directly to a plant’s roots, reducing the evaporation that happens with spray watering systems. Timers can be used to schedule watering for the cooler parts of the day, further reducing water loss. Devoto Gardens, Glashoff Farms, and Twin Girls Farm are a few of the Ferry Plaza Farmers Market farms that irrigate their crops with drip irrigation lines. Properly installed drip irrigation can save up to 80 percent more water than conventional irrigation, and can even contribute to increased crop yields. Many farms rely on municipal water or wells (groundwater), while some have built their own ponds to capture and store rainfall for use throughout the year. Properly managed ponds can also create habitat for local wildlife. 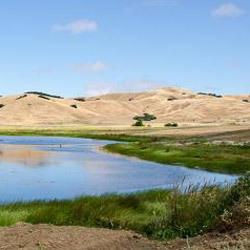 Marin Roots Farm relies on two ponds for all of their water needs, helping to minimize their impact on the surrounding watershed. Smart water management is not just about how water is delivered but also when, how often, and how much. To avoid under- or overwatering their crops, farmers carefully monitor the weather forecast, as well as soil and plant moisture, and adapt their irrigation schedule to the current conditions. Tory Farms, which uses flood irrigation in their orchards, waters at night to slow down evaporation, allowing water to seep down into the soil and replenish the water table. Growing crops that are appropriate to the region’s climate is another way that farmers are getting more crop per drop. Crop species that are native to arid regions are naturally drought-tolerant, while other crop varieties have been selected over time for their low water needs. Olives, Armenian cucumbers, tepary beans, and orach are a few of the more drought-tolerant crops you can find in the Ferry Plaza Farmers Market. California dry farmers don’t irrigate, relying on soil moisture to produce their crops during the dry season. Special tilling practices and careful attention to microclimates are essential. 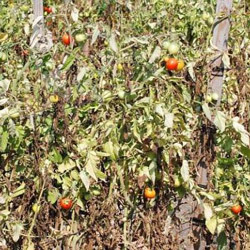 Dry farming tends to enhance flavors, but produces lower yields than irrigated crops. Dirty Girl Produce is known for their dry-farmed Early Girl tomatoes. Wine grapes, olives, potatoes, and apple trees can also be successfully dry farmed in California. Rotational grazing is a process in which livestock are moved between fields to help promote pasture regrowth. Good grazing management increases the fields’ water absorption and decreases water runoff, making pastures more drought-resistant. Increased soil organic matter and better forage cover are also water-saving benefits of rotational grazing. Bodega & Yerba Santa Goat Cheese and Marin Sun Farms, among others, practice rotational grazing to keep their pastures and animals healthy. Compost, or decomposed organic matter used as fertilizer, has been found to improve soil structure, increasing its water-holding capacity. Mulch is a material spread on top of the soil to conserve moisture. Mulch made from organic materials such as straw or wood chips will break down into compost, further increasing the soil’s ability to retain water. Compost and mulch help Allstar Organics, Tierra Vegetables, and many other Ferry Plaza Farmers Market farms retain more water in the soil during the dry season. Farmers may also use black plastic mulch as a soil cover to suppress weeds and reduce evaporation. Planted to protect soil that would otherwise go bare, cover crops reduce weeds, increase soil fertility and organic matter, and help prevent erosion and compaction. This allows water to more easily penetrate the soil and improves its water-holding capacity. A 2012 survey of 750 farmers conducted by North Central Sustainable Agriculture Research and Education found that fields planted with cover crops were 11 to 14 percent more productive than conventional fields during years of drought. 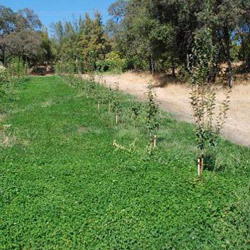 Woodleaf Farm uses perennial grass and clover in their peach orchards, and at Frog Hollow Farm, organic fruit farmer Al Courchesne swears by his use of cover crops for building healthy soil. The Dust Bowl of the 1930s was created by a perfect storm of deep plowing and loss of perennial grasses followed by extreme drought and wind erosion. Conservation tillage uses specialized plows or other implements that partially till the soil but leave at least 30 percent of vegetative crop residue on the surface. Like the use of cover crops, such practices help increase water absorption and reduce evaporation, erosion, and compaction. Date grower Flying Disc Ranch makes the most of their water use in the Coachella desert by using a mix of mulch, compost, and cover crop with no tillage. In a 30-year farm systems trial, the Rodale Institute found that corn grown in organic fields had 30 percent greater yields than conventional fields in years of drought. In addition to keeping many of the more toxic pesticides out of our waterways, organic methods help retain soil moisture. Healthy soil that is rich in organic matter and microbial life serves as a sponge that delivers moisture to plants. The trial also found that organic fields can recharge groundwater supplies up to 20 percent. Thank you to CUESA intern Janelle Shiozaki for her help in writing this article. Visit our Farming and the Drought Discovery Station at the CUESA Classroom to learn more. Goat photo by Denise Tarantino. Pond photo by Jenn Heflin.